There is a large lake or a wide river at your event site. You announce through the press and social media that someone will jump over the water with a motorcycle. There will be a lot of speculation. 'That's just not possible! To jump to the other side. That is clearly way too far.' Slowly more and more information is coming out about the gigantic motorcycle jump, and preparations seem to be made to insure a huge run-up. Would it all really be true? One thing is certain. On the day of your event, it will absolutely packed with people. Because whatever will happen; nobody wants to miss this. On the day of the event, when the crowed has gathered, a very small ramp is built on the edge of the water. The confusion is complete. This is impossible! Moments later the motor stuntman starts to warm up his engine. The tension rises. Is he really going to try it? Just before the approach a colleague parks his car awkwardly in front of the ramp, blocking the jump for the motorcycle stuntman, who has meanwhile started the approach as if he is not aware of the parked car in the way. With a huge crash, and a lot of fire, the motorcycle crashes into the parked car. 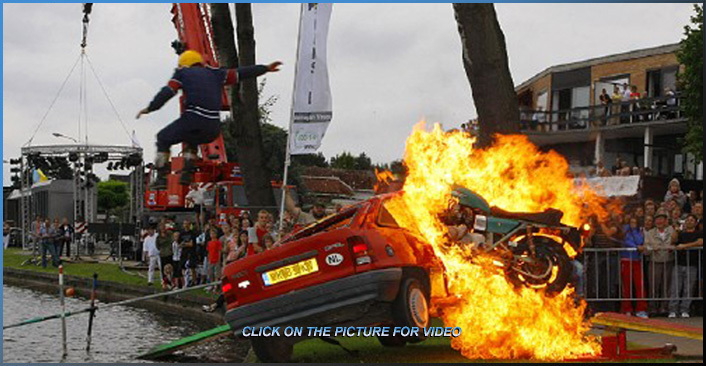 The stuntman is catapulted over the car and lands about 20 meters further in the water. A gigantic stunt that makes the motorcycle jump over the water, which was promised, instantly forgotten. If no water is available, we can also work with carton boxes to break the fall. The story with the jump over the water then no longer occurs. In that case it is a demonstration that shows how violent collisions between a car and a motorcycle are filmed for movies. In this case, some construction time is necessary. If working with water, the construction time is zero.